What FEI requirements do I need to compete? 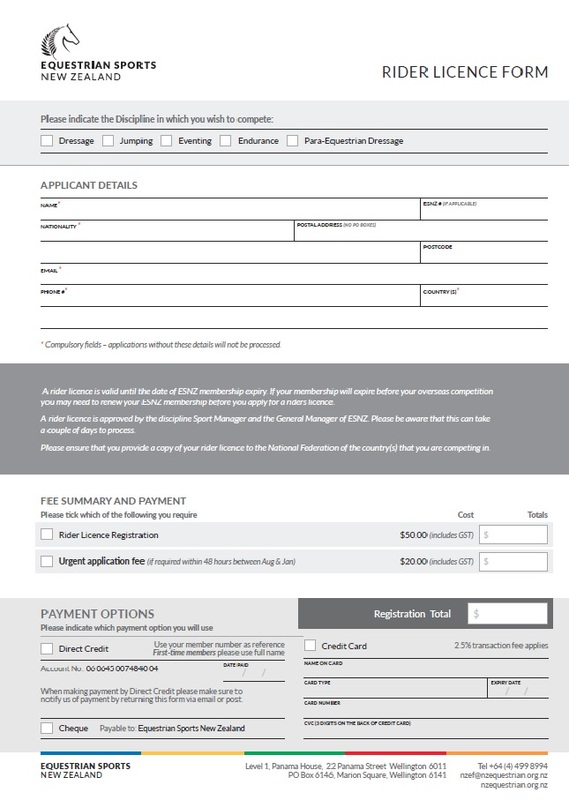 FEI Registrations are MANDATORY under the rules of the FEI and must be renewed before entering your first FEI Competition each year. All registrations expire on 31st December each year regardless of when during the year athlete or horse is registered. Registration is free of charge for riders that are under the age of 18 as of January 1st. FEI registrations for the following calendar year open on the 1st of November. FEI Registration is not required for riders and horses who participate only in the FEI Children’s Competitions and World Challenges. 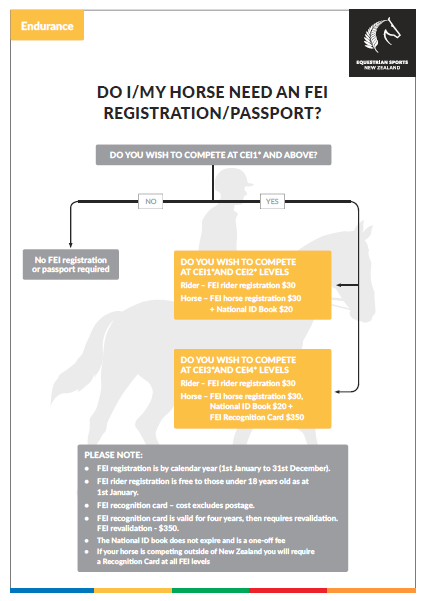 As of the 1st of January 2017 all newly registered horses with the FEI must obtain a national passport from ESNZ prior to registration (see FEI General Regulations Article 137). The National Passport must be filled out by a vet, include the horse’s microchip number and serves as a way to identify the horse by diagram and record the vaccination history. An approved National Passport can easily be upgraded to an FEI Passport as a Recognition Card once the horse reaches the level requiring an FEI Passport. The Rider must be a current ESNZ Full/Child Member. The Rider must be a New Zealand Citizen or be eligible to hold a NZ Passport (ESNZ members who are not NZ citizens and hold a passport of another country must be registered by the National Federation of that country. 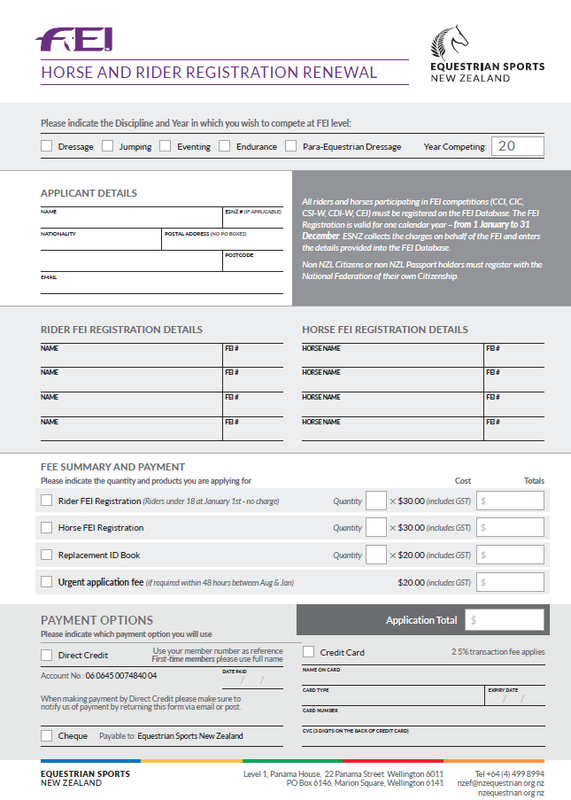 Have a current ESNZ Full Equine registration. Have a microchip (unless registered with FEI prior to 2013). Be recorded with the correct owners. Have a current FEI ID number or National Passport on record with ESNZ. Have at least one owner who is also a New Zealand Citizen and be eligible to hold a NZ passport. When do I need an FEI Passport for my horse? How much does it cost for a FEI Passport? An FEI passport costs NZ$350 and is valid for four years. Should the horse still require a FEI Passport following these 4 years it can be re-validated at a further cost of NZ$350 (increased charges may apply in four years’ time). How long does it take to process a FEI Passport? Have at least one owner that is also a New Zealand Citizen and is eligible to hold a NZ Passport. Do I Need a Rider’s License? A Riders Licence is a requirement if you are planning to ride overseas. Your ESNZ Full membership will need to be current as any license processed will run concurrently with your membership. When competing overseas you will be required to have an ESNZ Full Membership at $120/$80. 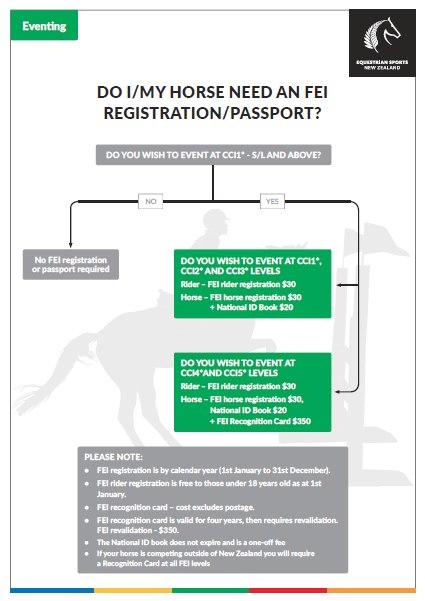 Please note that if you intend to ride in FEI classes overseas you will also need to be FEI registered. Some National Federations also require that you become a member of the country in which you are competing for national classes. New Zealand has the same policy for Foreign Riders; they must be members of ESNZ to compete at national level. How Much Is a Rider’s Licence? How do I Obtain a Rider’s License? Complete a Rider Licence Form and submit it to ESNZ with payment and we can arrange for a Rider’s License to be processed and emailed to you. How long does it take to process a Rider’s Licence? A rider licence is approved by the discipline Sport Manager and the General Manager of ESNZ. Please be aware that this can take a couple of days to process. What is a National Passport? registered with the FEI and be identifiable. From 1 January 2017 all newly FEI registered horses must have a national passport approved by the FEI (see FEI General Regulations Article 137). The National Passport serves as a way to identify the horse by diagram and record the vaccination history. An approved National Passport can easily be upgraded to an FEI Passport as a Recognition Card once the horse reaches the level requiring an FEI Passport. Equine Anti-Doping and Controlled Medication testing. Who needs a National Passport? All new FEI registered horses from 1 January 2017. All Horses upgrading to an FEI Passport/Recognition Card from 1 January 2017. How do I obtain an FEI passport, National Passport or Recognition Card? FEI Passports and Recognition Cards are obtained from National Federations, and must be re-validated every four years. National Passports are also obtained from National Federations, but do not require revalidation. In order to obtain a National Passport, FEI Passport or Recognition Card the horse must be microchipped. All horses being registered with the FEI for the first time must also be microchipped. Only a registered veterinarian can complete the diagram and description pages and implant the microchip. I am going to start competing my horse in FEI events for the first time. Do I need an FEI document? passport and must have FEI registration. and can be issued by your National Federation. I am wanting to compete a new FEI horse in an FEI event in January. What should I do? 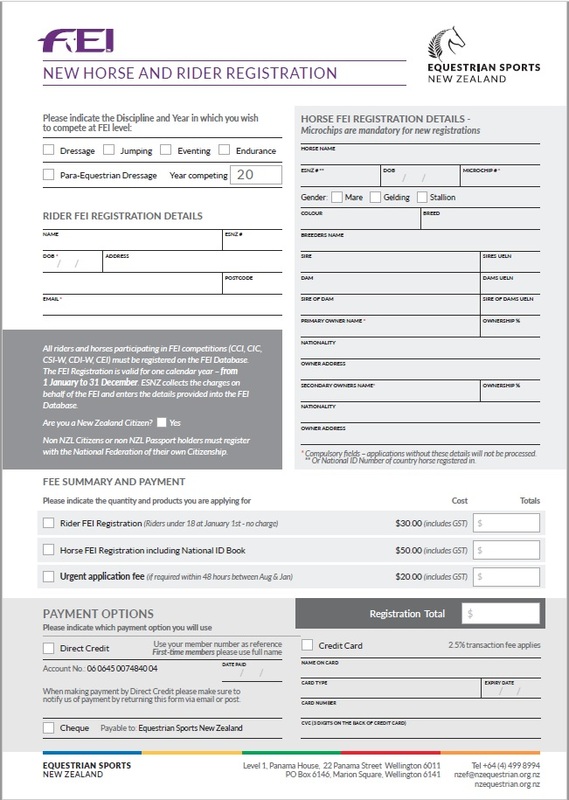 You will need these validated by ESNZ by mid December of the given year if you wish to compete in FEI competition in the following January and onwards. You will also need a National Passport, these are obtained from ESNZ. FEI registrations (for horse and rider) for 2018 open from 1 November 2017. What will the national passport cost me? 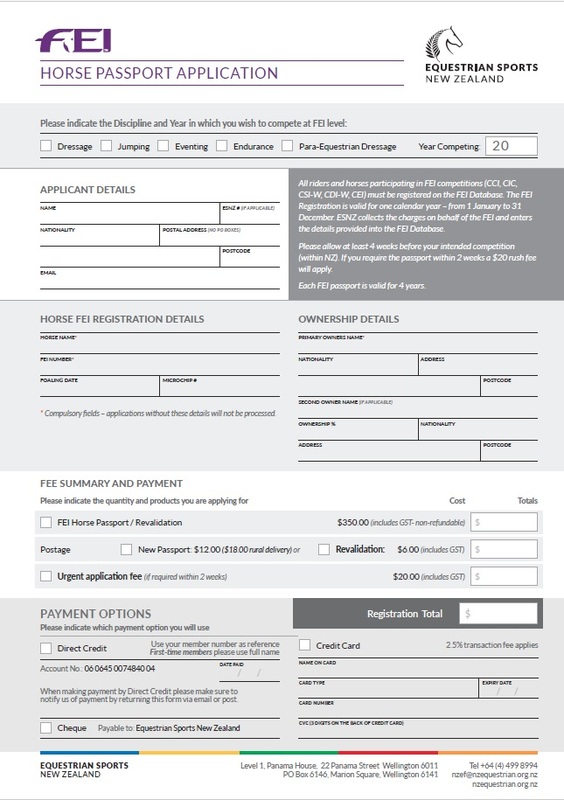 The ESNZ National Passport is $20 and is included in the cost of registering a horse for the FEI for the first time. The ID section will be required to be completed by a registered veterinarian. I have bought a horse which has an FEI Passport/FEI Recognition Card. What should I do? You must send the FEI document to your National Federation. They will certify the change of ownership and forward the information to the FEI. Will this be rolled out again for all New Zealand registered horses? Will the ESNZ national passport allow my horse to travel overseas and compete? 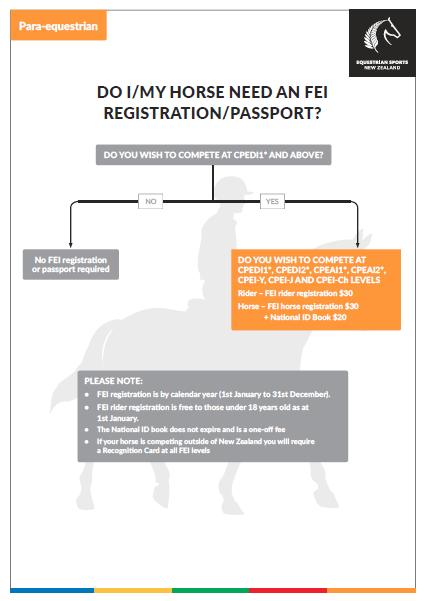 No, the ESNZ national passport is for FEI competition within NZ only; your horse will require an FEI passport for overseas competition. I compete in endurance on my horse, and it already has an ESNZ logbook for this – can this be used as a national passport? logbook, AND a new national passport.